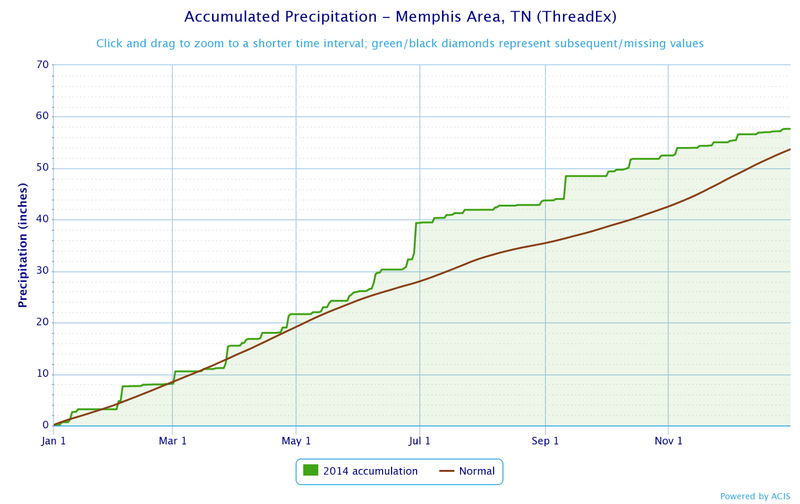 Overall, 2014 can be characterized as cool and wet in the Memphis metro, marked by a few specific events or periods that give rise to that characterization. As outlined below in the statistical summary, two very heavy rain days provided nearly one-fifth of the total rainfall for the year - without those two days the 2014 rainfall would've been over 6" below normal, while a "Garden of Eden" summer (particularly a wet June and cool July) and very cold late fall (November) contributed to below normal temperatures. Despite the cool than normal temperatures, Memphis touched 100 degrees once late in the summer (August 24, which also tied a record high for the date) when conditions turned hot as children returned to school. That was offset by a cold January that featured two days with lows in the single digits. Severe weather was infrequent in 2014. There was one tornado in the Memphis metro, an EF-0 (75-80 mph wind) that occurred early in the morning on April 28 in the Bolton community of northeast Shelby County. (That was also the day of the Tupelo, MS EF-3 tornado that made headlines.) 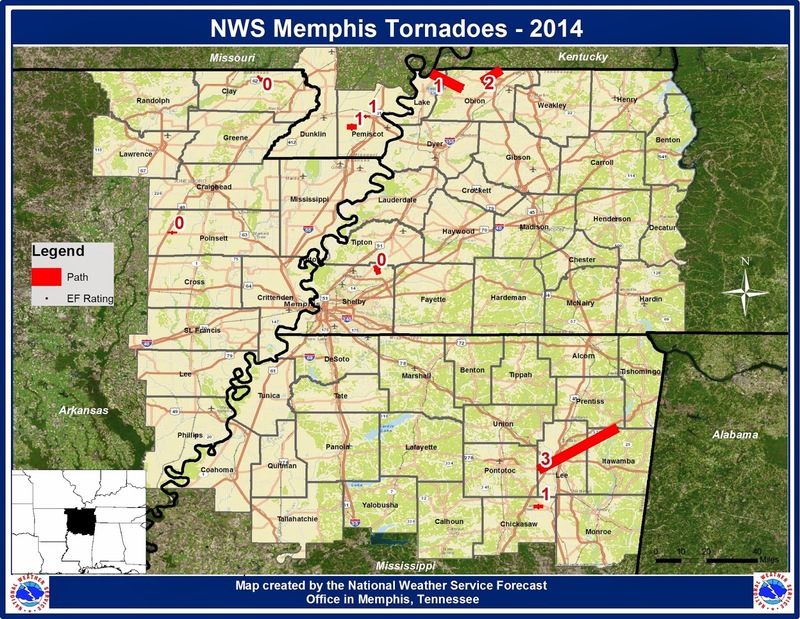 NWS-Memphis issued 18 Tornado Warnings during 2014 that touched some part of the 8-county MemphisWeather.net domain (Memphis metro area). Strong thunderstorms and very heavy rain were much more common than rotating supercells or tornadic spin-up's in squall lines across the Mid-South. Records set or tied: Record low on May 16 (46), record low maximums on July 18 (69) and July 19 (79), record low on July 29 (64), tied record high on August 24 (100), tied record warm minimum on August 25 (79), record warm minimum on November 30 (61). Comments: July 2014 was the 6th coolest on record (78.0 degrees). 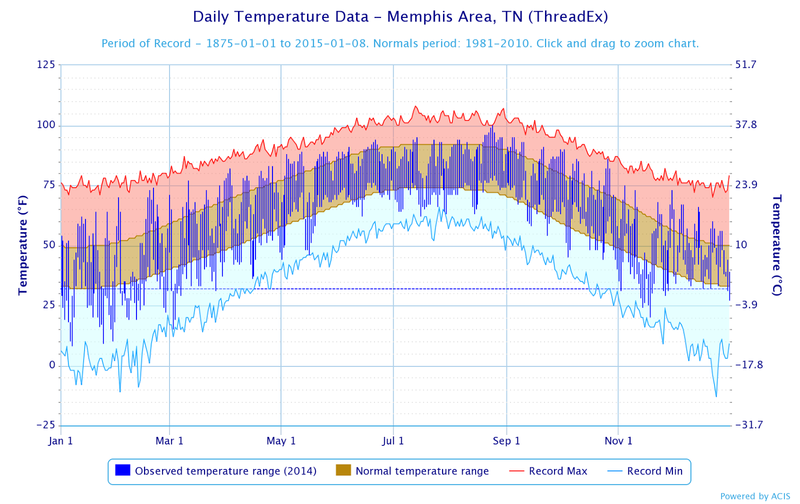 2014 was the coolest year in Memphis since 1997 and 15th coolest on record. Temperatures for the year (lows/highs) are plotted in dark blue against the normals (brown), record highs (red) and record lows (light blue). Where the dark blue extends above or below the brown indicates temperatures above or below normal, respectively. Records set or tied: February 4 (2.88"), March 2 (2.39"), March 28 (3.14"), June 29 (5.87"), September 11 (4.45"). Comments: Two heavy rain/flash flood events accounted for 18% of the year's rainfall - June 29 (7th wettest day on record) and September 11, both also daily records. 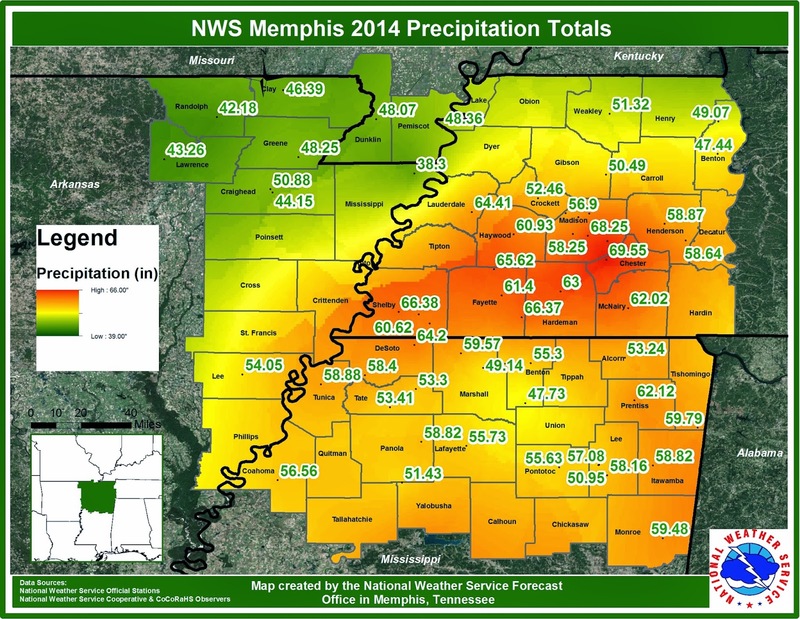 June 2014 was the 2nd wettest June and 8th wettest month on record (13.40"). Precipitation accumulation for 2014 is plotted as the dark green line, compared with a normal year in brown. Precipitation stayed fairly close to normal until June when it jumped well above normal before narrowing the gap over the last quarter of the year. Click here for monthly/daily statistical recaps for Memphis International Airport. Click here for monthly/daily statistical recaps for Bartlett, TN. 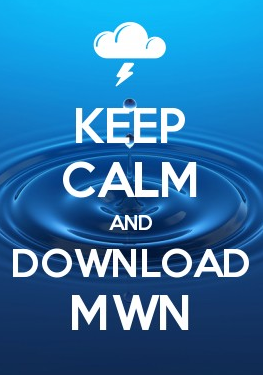 MWN's forecasts extend out five periods (2.5 days, or roughly 60 hours) and the numbers above represent the error/accuracy of the entire 2.5 day period. Historical accuracy statistics can be found here.